Pino Lella wants nothing to do with the war or the Nazis. He’s a normal Italian teenager, but his days of innocence are numbered. In an attempt to protect him, Pino’s parents force him to enlist as a German soldier—a move they think will keep him out of combat. But after Pino is injured, he is recruited (at the age of 18) to become the personal driver for Adolf Hitler’s left hand in Italy, General Hans Leyers, one of the Third Reich’s most mysterious & powerful commanders. Now, with the opportunity to spy for the Allies inside the German High Command, Pino endures the horrors of war & the Nazi occupation by fighting in secret, his courage bolstered by his love for Anna & for the life he dreams they will one day share. 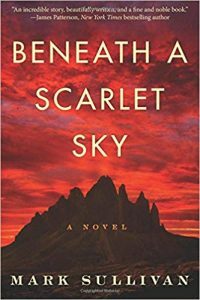 Based on the true story of a forgotten hero, Beneath a Scarlet Sky is the triumphant, epic tale of one young man’s incredible courage & resilience during one of history’s darkest hours.